ALAN BRADLEY, AUTHOR OF THE MOST AWARD-WINNING SERIES DEBUT OF ANY YEAR, RETURNS WITH ANOTHER IRRESISTIBLE FLAVIA DE LUCE NOVEL. 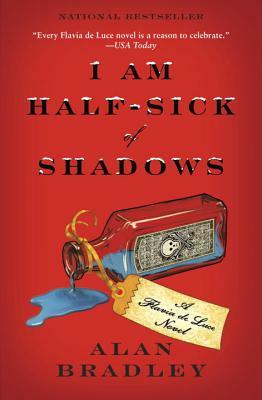 It’s Christmastime, and Flavia de Luce—an eleven-year-old sleuth with a passion for chemistry—is tucked away in her laboratory, whipping up a concoction to ensnare Saint Nick. But she is soon distracted when a film crew arrives at Buckshaw, the de Luces’ decaying English estate, to shoot a movie starring the famed Phyllis Wyvern. Amid a raging blizzard, the entire village of Bishop’s Lacey gathers at Buckshaw to watch Wyvern perform, yet nobody is prepared for the evening’s shocking conclusion: a body found strangled to death with a length of film. But who among the assembled guests would stage such a chilling scene? As the storm worsens and the list of suspects grows, Flavia must ferret out a killer hidden in plain sight.